Next page of reviews everything we needed in one place! right off the kitchen and making us breakfast smoothies at the “Tiki” bar. The younger practiced her with her new snorkel in the pool as her sister had 2 yrs ago and off they went to the reef off “Somewhere” of see turtles, rays and “fishes”. Their mother dove again and experienced the “best dive ever” – actually with a humpback whale !!!! they rode with Provo ponies -we took a pontoon boat in Chaulk Sound out of Las Brisas which was beautiful – the water colors are amazing! We would highly recommend this rental. The location is ideal and the house has so many things available to make you feel right at home. Thank you Ramona for everything. I really appreciated all of your emails and advice. Thank you also to Wendy and Jameka for your assistance throughout the week. We will miss the kitties….. all three of them we so sweet. We woke up our last morning in Turks to sun and 80 degrees, and ended our day back home in Pennsylvania to snow. I think it’s fair to say we will be back and hope to stay at this beautiful property once more. We Had The Best Time At Barefoot Palms! You Will, Too! We’ve been to Provo 4 times within the past 10 years and Barefoot Palms was the best! We will be back! Rental was easy. We’ve traveled extensively on Providenciales for our family vacations. Our preference is for more secluded beaches & favor those located by the leeward side of the island including Sunset Beach (long and expansive) & Pelican Beach (smaller, more cove like) at the eastern tip of Grace Bay. Both beaches are within easy walking distance (about 5 – 8 minutes) of the house and are straight paths. Barefoot Palms comes fully equipped with practically new Tommy Bahama beach chairs, coolers, umbrellas and even a beach cart with big wheels to lug all the gear over sand which we easily did for the four of us! We had long stretches of Grace Bay beach on the leeward end all to ourselves with the exception of the occasional passersby. Absolutely gorgeous! But enough about the beaches. The Barefoot Palms Villa was perfect for the four of us my daughter, her boyfriend, my wife and myself. We easily could have accommodated more people as there was still an additional bedroom that went unused. The house is open concept which makes for great entertaining. It is even nicer than the pictures. And if you want to watch a movie, the selection they have on hand is phenomenal. Every day after the beach we would rinse off at the outdoor shower and then chill out by the pool and Tiki Bar. We had brought along a Bose bluetooth speaker and played from a Caribbean songs list from Spotify as we recapped all the activity of the day. One night we even cooked steaks (we had brought with us from Boston) on their gas grill that was very nice. We rented a car because we are comfortable driving on the island. You don’t have to rent a car to stay here but I recommend it as the cabs are expensive or at least rent bikes or scooters. The best supermarket(Graceway Gourmet) that is in the heart of Grace Bay is too long to walk but would be about a 20 minute bike ride or scooter ride or a 10 minute car drive. There are also smaller convenience markets located at Blue Haven (about a twelve minute walk) which is stunning that are open to the public even though it is an all-inclusive resort where you could pick up a six pack of beer, or a bottle of wine, or fresh coffee & croissants. I feel like I know Ramona although I’ve never met her because her personality shines through in the decor and flow of the house. It is stunning and remarkable. I have a feeling she is too. We had a 7 girls (women) trip. We did a lot of relaxing and this home is the place for that. The pool was fabulous. Plenty of room for all of us with all we needed. The closest beach is walking distance but a bit rough. We found Sopadillo beach the place. Go on the snorkel trip with Island vibes and don’t miss the Thursday night fish fry with the local dancers. We will go back to this house and they could not have been more helpful and accommodating. Thanks Ramona and Jameka. We have rented many houses in the Islands and this house is by far the nicest one we have rented! Perfect setting! The house is clean, beautifully decorated and well stocked with everything you need! The pool is great and you are just a short walk from the beach! We loved it here!! Barefoot Palms was the nicest, most immaculate and comfortable vacation home we’ve ever stayed in. It included all the amentities and was perfect walking distance to the gorgeous beach. Can’t wait to go back! Ramona left us everything to use which was well appreciated. Didn’t have to rent beach chairs or towels. House is beautiful, close to best beach in Turks&Caicos! Backyard, tiki hut, and pool amazing. We definitely recommend…and I am picky!! Amazing place to stay!! We will be back. We were 3 couples staying at the barefoot palms villa during the last week in April 2018. This beautiful home had plenty of space for all of us. All of the bedrooms have very comfy beds and a/c units in each. There is also central a/c in the rest of the house. We especially loved the pool area and tiki bar. We barbequed on the patio and made a lot of great memories in this great spot. This house is a short walk to a spectaular beach. We also found another entrance to the beach a little further away but still walking distance that allowed us to walk the beach all the way down to the resorts. We rented a vehicle for the week and spent a lot of time exploring this beautiful island from one end to the other. I highly recommend this home! Thank you Ramona for sharing your sancuary in Turks & Caicos. This was our fourth trip to Turks, but our first time in Leeward. Barefoot Palms was perfect for us–a comfortable home base, near to everything in Grace Bay but far enough away to have peace and quiet. We loved being so close to Pelican Beach and appreciated how the house was well equipped with entertainment options. I've looked at every house in the Caribbean on VRBO, just stay here and stop searching! We stayed at this house for five nights at the beginning of February. Finding the house and checking in was a breeze. All of the instructions that were provided to us were spot on. Jameka, the property manager, was extremely pleasant. She met with us for a few minutes after checking in to show us over the house. We also had a chance to briefly meet the property owner, who was staying elsewhere on the island for a few days. She was wonderful as well and it was easy to tell that this was someone who truly cared about her guests and took the utmost care of her house. The property was incredibly clean, and I don’t think the location could be beat. It’s in a great neighborhood and was a stone’s throw from from all of the restaurants and activities of the Grace Bay area, but also secluded enough to really relax and enjoy some peace and quiet. The pool area was great, the bedrooms were large and spacious with very comfortable beds. The house had everything that you could need including beach chairs, towels and coolers. Also all of the TVs had Netflix which was really nice as well. The beaches near the house were gorgeous. We tried going to the heart of Grace Bay one day, but we found those beaches were more crowded and not anywhere as nice as the Leeward beaches closes to the house. As previous reviewers mentioned, renting a car is a must, but it’s really a piece of cake getting to the house and getting around. Something we tried that was a lot of fun was using Discovery Tours. Via boat, they dropped us off for the day on our own private island with food, drinks, chairs and umbrellas. We brought a Bluetooth speaker and some snorkel equipment and had an incredible time exploring. This was our first time to Turks and Caicos, and we usually like to travel around and see new places however this was one house that we agreed we will definitely be coming back to. Thank you so much Ramona for allowing us to use your perfect beach house!!! Wonderful time at Barefoot Palms!! The house is very much as it looks in the pictures. It was clean and comfortable and a 10-15 minute walk to beautiful Sunset beach in the Grace Bay area. This is definitely the side of the Island you want to be on. The Grace Bay beach area is 7 miles of beach so beautiful you are not sure it can be real. The sand is so soft and the water so clear it takes your breath away. The tiki bar was a lot of fun to hang around and the pool is lovely. There is a little cat that hangs around who is cute and sweet and becomes the house mascot. The kitchen is well stocked with cooking items and we never needed something we did not have. There are some spices and salt and pepper there for you to use. I really recommend to pack some pre-packaged food and snacks in your suitcase as food on the island is very, very expensive. I also recommend (Ramona the owner clued me in) you pack a bottle of alcohol, rum, vodka or the like as again it is very expensive on the island. By doing this, we saved a lot of money that we could enjoy on other things! The refrigerator has filtered water and makes plenty of ice. They also provide coolers and ice packs for a day on the beach. The TV was a bit confusing to use but they have tons and tons of movies to watch. They also provide beach chairs and beach umbrellas which were very nice. There is a washer and dryer but honestly we never used them. They provide plenty of beach towels but a few more bath towels would have been appreciated. The bedrooms were lovely and the beds were very comfortable. The bathrooms were very nice and there was plenty of hot water. They say there is a max on the electricity but we must not have gone over as we were not charged anything. I think we tried to turn out lights and did not go crazy with the A/C but we were not crazy or anything. We did a combo of eating in and eating out and were happy with the dining table and the picnic table outside. I guess there is a concierge, but honestly, she came at the beginning and we never saw or heard from her again. All in all the house was wonderful and I would give it my recommendation, Thanks!! WOW!! This was hands down one of the best vacation rentals. After exploring the Island we LOVED coming back to Barefoot Palms and unanimously declared the location the best on the Island. The house layout was perfect and they had everything you needed to make your vacation complete. Access to the beach was awesome, we actually were picked up by Island Vibes for the 1/2 day snorkeling excursion! Thanks for a wonderful vacation rental! Great overall stay. We stayed post hurricane and many places on island still doing work and renovations. House conveniently located near great beaches that are a 5 minute walk or 2 minute drive. On arrival, met at house for instructions and keys. Very responsive and assisted with small issues- security system beeping and payment needed for cable (both fixed right away after a quick text message). Pool and outdoor space nice. Beach chairs, umbrella, and small coolers available for use at beach. Good supply of towels in bathrooms and for pool/beach. Hope to visit again. Recommend highly! Just returned last week from a week in beautiful Turks and Caicos. It goes without saying that the beaches in Turks and Caicos are among the most beautiful in the world. Well, this villa was the perfect home away from home to return after a hot day on the beach. Ramona has stocked the villa with everything including spices for cooking and every utensil and appliance that you need for enjoying a relaxing meal at home. Restaurants, shops and grocery stores are a short 10 min. drive away. The pool is a perfect place to cool down after sunning on the patio and there is a small beach a short walk from the villa when you don’t want to deal with crowds closer to the shops. All of the items that you need for a relaxing day at the beach like towels, chairs and umbrellas are sitting right at the front door in the villa. My family and I throughly enjoyed out time at Barefoot Palms and look forward to visiting again soon!!! "Our vacation home"...just as good as if we owned it ourselves. Our family really enjoyed stating at Barefoot Palms during our vacation in Provo, Turks and Caicos. If you’re looking for an area of the island that is more relaxed and away from the hoards of tourists, this is the place to stay. Very easy walk to white sand beaches and turquoise water where kids enjoyed swimming for Conch shells. Surf here was minimal where safety was not a concern. Only a handful of families on the beach (felt like a private beach). The house has beach chairs, umbrellas and beach towels to use. Pictures of the house are right on mark. Very clean house, great outdoor area in the back, fully furnished kitchen (pots/pans, etc), a safe in the master bedroom are among some of the key highlights. Never saw any bugs inside. House has central air and each room has A/C although we rarely needed to use it. Kids (9 and 11) really loved the pool. It was nice to come back from the beach and use the outdoor shower to get all the sand off. As FYI for those with disabilities, the house does have steps from main entrance/bedrooms to the living room/kitchen/patio pool. House is close to shopping and restaurants. We had a rental car (a must) to be able to get to all the good snorkeling places and restaurants (Grace Bay and Turtle Cove recommended). On the same area of the island we recommend Big Blue Unlimited outfitters. We used them for scuba diving (limits each boat to few divers for better service) and kayaking to the protected Iguana Island (kayak from Big Blue to the island and Mangroves). The whole team of Barefoot Palms is VERY responsive. They get back to you very fast, something that was much appreciated compared to past VBRO experiences. Ask them about the discounts available for restaurants and other vendors when you book your stay here. If we go back to the island, we hope that it is available. Definitely would stay there again! We traveled with my parents and our children for 10 days. This villa was by far and away the best we have used! There was plenty of room for us all, it was safe, and every amenity you needed was there! Blender for morning smoothies at the tiki bar, pool toys, beach toys, travel cooler with ice packs, beach chairs, games, outdoor shower to rinse off sand, washer and dryer, appliances that all worked! Ramona and Jameka were always accessible for any needs, recommendations, or questions. The pool was perfect for those hot afternoons before dinner! And it was cleaned even twice while we were there! The location was what we were looking for…walk to the most beautiful beach I have ever been on, just far enough from the major hub of Grace Bay but a short drive there, and in a very safe area. Our personal recommendations for the islands… AquaTCI for diving! Hands down a fantastic scuba diving operation! They are a small company that provide smaller, more personalized scuba experiences for every level of experience. Safety is paramount as it should be! All new and well maintained state of the art gear for rental. The diving in the Turks is simply amazing! Dinners- Best dinner was Bay Bistro. Baci was beautiful particularly outdoors and more affordable than other places on the island. We also enjoyed Magnolia’s. We were greatly disappointed in Coco Bistro for the money and the fact that we had to make reservations 3 months in advance. Yummy and memorable lunches at Somewhere but beware of the woman beading hair on the beach there! also just off Somewhere we were just snorkeling and came across eagle rays and turtles in 15 feet of water!! You will not be disappointed in this villa or this island!! We just returned from our 10 days at Barefoot Palms and we can’t say enough about the Villa or the communication with Ramona and Jameka. The layout was perfect for our family that included 2 girls ages 5 and 8, their parents and grandparents – everyone had their own space. The girls were in the pool from 7:30am and only came out to go to the beach – only to return to the pool after the beach!!! We wanted for nothing in the villa as well. What can I say about the Turks?? A different day a different beach and all are beautiful. Our family divided up for some activities, but, enjoyed Provo ponies and riding the beach, Bugaloo’s where the younger granddaughter also got to ride the ponies, scuba and snorkeling off “Somewhere”. So many wonderful restaurants!!! Caicos Café, Bay BIstro and Magnolia’s stand out as 3 of our top choices. We usually ate breakfast in – by the pool, made lunches and go off for the day. Thank you helping us make wonderful memories – we will be back!!!! My family and I just got back from Barefoot Palms where we stayed for 10 days. The house was perfect for the six of us. With three bedrooms, a large living room, and kitchen/dining area we had plenty of room to spread out. We brought quite a bit of food with us and grilled out three nights for dinner. Each day we would casually have breakfast and then plan our day. Most days included a short, easy walk to the most beautiful beach imaginable, Pelican Beach. We’d then have lunch out by the pool and relax (nap) in the warm sun during the afternoon. For dinner we’d eat in or try one of the great restaurants close by. Our rental car sure came in handy as we explored Chalk Sound, Turtle Cove, and Sapadilla Bay – beautiful beaches everywhere. Jameka was there to check us in, answer our questions, and help get us settled in. The wifi was excellent (important to me as I did some work while there) and all the TV’s have Hulu, Netflix, etc for complete entertainment. We highly recommend Barefoot Palms and hope to return again! My wife and I stayed at Barefoot Palms for a week, and it was the perfect escape. As soon as you walk in, it feels that you are home. The back patio was where we spent most of our time. It is very close to Pelican beach which is beautiful. All of the major restaurants and shopping areas are only 5 minute drive which is very convenient. Ramona and her team made the process very easy, and I would highly recommend this villa to anyone who is looking for the perfect private getaway. My wife and I have been down to Turks and Caicos 7 or 8 times in the past 3 years. We quickly switched from resort experiences, prices, and product to home owner offerings. We love to swim particularly in pools and had wanted to rent this well priced villa fir sometime and finally got the chance this past November. We were extremely pleased with the home, and found it to be genuine, inviting and well situated. We particularly enjoy leeward for the community feel of the area and typically start our day with a walk to blue haven for coffee. The home is ideal for a full family with plenty of space to spread out. We will be back again with extended family and look forward to Ramonas hospitality. The owner has great insight into the island and never hesitates to respond to any question we asked. This is a perfect home for an island get away. Perfect for families to rent since there are three bedrooms. The location is great with a beach right down the road, which was our favorite. We did drive all around the island but always found ourselves back at this beach. The house had everything we needed, the pool was a great way to end our day. Ramona was so easy to deal with and answered any questions immediately. She had lots of suggestions. Excellent home is great area! Barefoot Palms is a good surprise, a very nice home perfect for a small group or family. Located in most desirable area in Provo, beach, shopping, activities and dining. The home is comfy, very clean, and has terrific A/C system that cools the bedrooms in minutes. The pool and tiki bar are perfect for the time you don’t want to head to the beach. Also, the owner, Ramona is so accommodating, she will help you literally with anything! Also a good value, as the owner has set prices very competitive to keep her home rented – we recommend this home. We rented Barefoot Palms for a week in July. We’ve used vbro many times and we had another wonderful experience this time. First off, Ramona, the owner is terrific with answering questions, giving recommendations, assistance etc. It saved me a lot of time rather than going over to the Tripadvisor forums to ask questions. Also when the power went off in Leeward for just 45 minutes one night, Ramona called to check up on us. Also, Jameka and Wendy who are nearby on the island are very helpful if the need arises. I am so thankful that we stayed on the Leeward end of the island because we felt this beach was by far the most spectacular and suited our needs better than Grace Bay. I had looked at another property that was in the chalk sound area and I’m so glad that I did not choose that one. It is just a short walk to the beach and I went running every morning on the beach up to Emerald Point. There are some large homes built on this beach, but they are set way back so as not to deter from the beauty of this amazing beach. Try snorkeling around some of the rock formations. Also, we felt the safest in this area of the island, not that we had any issues, but it was a very nice community. Lastly, the house is older, but is well maintained and has everything you will need. The pool is wonderful and the plants, trees surrounding it are beautiful. We’ve been on many islands where the internet/tv/electricity/water etc gave us problems and that was not the case here. You won’t want to spend a lot of time watching tv or using the internet, but it’s there if you need it. The rental price is right on target, and compares to similar homes we’ve rented on other islands. My husband and I spent a beautiful long weekend this winter at Barefoot Palms! Every positive bit of praise below from other guests regarding Barefoot Palms is right on the money! Actually it is even better than described! The Villa is much more beautiful thank the pictures show!! it is SPOTLESS & extremely well equipped! has everything you could possibly need and then some etc. a Very short walk to a GORGEOUS BEACH! The OWNER AND ON ISLAND MANAGEMENT STAFF A PLEASURE to deal with whatever you need taken care of! I want to ADD a bit more! We have been travelers for many many years. For beach trips we have covered a lot of the Caribbean, South Pacific, Mediterranean,and even Asia. But Providenciales has become our favorite for many years now! HOWEVER one thing we have INSISTED ON no matter where we go! We love being in a hotel/home DIRECTLY ON THE BEACH or at least a FULL VIEW of the water right outside our door or porch!!! WELL…..THANKS TO BAREFOOT PALMS that has changed BIG TIME! We are CONVERTED! From day one we not only LOVED IT but felt as if OUR OWN HOME was transported to the Caribbean with the addition of being only STEPS from gorgeous beach and with a pool and even a TIKI BAR! DO NOT HESITATE TO TRY THIS LOVELY VILLA! We are counting the days until our next visit! So much to say about this amazing house! The house is truly beautiful, you walk in and just feel instantly on vacation, the colors, the decor it all perfect! The house was spotless! The pool, was perfect …we fell in love with the Tiki Bar! We had wonderful night time swims and cocktails in the tiki Bar.. loved that you needed nothing.. There were beach umbrellas, beach chairs, coolers, suntan lotion, some were left from other guests, and we did the same.. It was great! The beach was only a few streets,you can walk,but we drove because I was lazy and didn’t want to carry all the Beach gear ..Lol!! Any questions that I needed help with I just called Jamika, she was Great! You call and she right there to help you! I have nothing but great things to say about Barefoot Palms! hoping to go for 2 weeks next year! ??☀️? We loved Barefoot Palms! The house is more beautiful than the pictures show. It’s a very easy walk to the beach, just two blocks straight shot on a paved road. Everything in the house is up-to-date and very well equipped. The beach is absolutely beautiful, we’ve been to 4-5 other islands and Turks and Caicos with the clear, turquoise water and white sand is definitely the most beautiful i’ve seen. Many great restaurants, but our favorite was Cocoa Bistro which you will need to make a reservation for a month prior, unless you have dinner in the lounge, which is what we did and loved. Such a Beautiful Island Getaway Home! 3 couples–my husband and I, my brother and his wife, and my niece and her husband, enjoyed a week at Barefoot Palms Villa in Turks and Caicos. The house was beautiful, very well equipped, clean, and decorated beautifully! The pool was a favorite spot–swimming, the tiki bar, and the cute little swim-up table in the pool were thoroughly enjoyed by all. The Wi-Fi was great; the kitchen was very accommodating. We didn’t mind the short (very short) walk to the beautiful turquoise water of the beach! We felt very safe at the villa. Ramona, the owner really answered alot of our questions before the trip and her staff were just a call away when we needed anything. Providenciales itself is a beautiful place..the water of the ocean is the prettiest…we did a boat ride and snorkeling excursion, which was a great way to see Sapodilla Bay. The restaurants we tried were very nice. And we loved the Fish Fry on Thursday Night! We definitely want to come back to Barefoot Palms and it was a great week there! Thank you Ramona for sharing your home for a great vacation experience! Our family of 4 stayed at Barefoot Palms for 8 nights over the Christmas / New Year’s holiday. It was our second trip to Provo. Barefoot Palms is an awesome house – well equipped kitchen, etc. Leeward is very quiet and Pelican Beach, about 2 blocks away, is mostly deserted. Beach chairs, umbrellas and the coolers provided were a real nice touch. Pool was a great place to unwind at the end of the day, or to cool down after a morning run on the beach. We loved it so much that we tried to book for next year, but were too late! We loved it. What a great place. Larger than the pictures show and nicely updated. It has every thing we needed for our trip. Great bedrooms, large enough kitchen with about everything you need. Eating areas inside and out. Security system to make you feel safe (truly we always felt safe everywhere we went on these great islands). A pool. TV area with way more channels and movies than we needed. The property manager was great. Met us at the airport and brought us to the villa. Showed us everything we needed and let us be. We are a family of four with a 10 & 12 year old girl and boy. We had more than enough space and felt very at home here. The pool was great for our lazy days and the beach about 2 short blocks away was fabulous. In the villa there was a binder with directions to many beaches and brief write ups on many restaurants. The islands themselves are truly amazing. If you are looking for perfect weather and the best beaches then this is the place. Did I mention Ramona? The villa owner is a wealth of knowledge on TCI and very willing to share all she knows with you. If you email her she will answer, and very promptly too. I have nothing bad to say about this villa, every thing was better than we expected. I would recommend it to friends, family and others and will defenately stay here again. Thank you Ramona for your part in our perfect vacation. Barefoot Palms was the BEST choice for our family in Turks and Caicos! Spent 6 nights on June 25-July 1 2014. The house was wonderful and fully equipted with everything we needed from beach towels to beach chairs to the blender we used daily to make our own margaritas! Our teenage daughters loved both the pool and the proximity of the house to the beach… We even spent an evening as a family watching the stars come out on the beach! This was the best family vacation we have taken in years!! Can’t say enough about how fantastic this house was for us! Am planning our return visit now!! This was our second time staying at the villa and once again it did not disappoint. In fact, we became more in love with it and Provo. Our family of four (boys aged 6 and 4) feel so at home here and enjoy the pool and 2 minute walk to one of the best beaches on Provo. The house is welcoming and it has all the ameneties/supplies you could want. It’s truely a home away from home and minutes drive to everything on the island. Three of us stayed at Barefoot Palms for two weeks in February. We absolutely loved it. The house is FULLY equipped with everything you can possibly require, from small kitchen appliances, to BBQ items, etc. Beach items are provided for your outings suchs as chairs, coolers, umbrellas, etc. The house is comfortable and we only had to turn on the air conditioning at night. The ceiling fans keep the house cool enough during the day (that is if you are staying inside). The ouside dining area is ideal – that is where we had all our meals when we were eating in. The pool is great and the beach is so close (a 5 minute walk down the road). Restaurants are about 10 minute drive (a car is necessary if staying in Leeward since taxis are expensive). The owner was a pleasure to deal with and answered all our questions. I wouldn’t hesitate a minute in recommending this villa which comfortably can accommodate six people. My one suggestion would be to bring bug spray though – since there are lots of shrubs surrounding the property we found after having dinner out the first night that we had little bites on our legs. Just returned from an amazing trip to Turks. Staying at Barefoot Palms was the best decision! The house is beautiful (photos don’t do it justice). 5 min walk to the beach and it felt like our own getaway. You’re far enough away from the resorts you don’t get a lot of people on the beach, but close enough it’s just a short drive to tasty restaurants. Definitely try Hemingway’s and Somewhere Cafe! We LOVED the pool/tiki hut for late night happy hours and swimming! All of us agreed we would come here again! Thanks Ramona, it was a trip to remember! The Perfect Place to Stay in Paradise! We stayed at Barefoot Palms for one week — and couldn’t be more in love with a place! The villa is beautiful, and exactly like in the pictures you see. The most amazing beaches are a couple minutes walk from the house. I highly recommend a rental car during your stay. Ramona & Simone were great to work with and very helpful during the booking and our stay on the island. We can’t wait to go back and would definately stay here again. THANK YOU! Our family just returned from Barefoot Palms, and what a fabulous vacation spot! After touring the island and seeing the other areas we considered renting at, it was obvious we chose the best place! This home is beautiful, comfortable, clean, well stocked, and in a lovely area! We very much enjoyed the pool, patio and grill . . . large area, private . . . fun day and night! Pretty with the night lighting and tiki torches. The surrounding beaches are gorgeous and private. Simone, the property manager, is very sweet and helpful! We were there for 8 nights and had a mid-week cleaning as part of the rental, which was nice! Ramona is FABULOUS at making recommendations and suggestions for places to go/things to see and do, as well as very patient and responsive to any questions you may have! I just cannot say enough good things about our experience on the island!! Grace Bay Car rentals and Caicos Dream Tours do honor the 10% discount for staying at Barefoot Palms with no problem! The 1/2 day snorkel trip with Caicos Dreams Tour was one of our favorite tours, as was our island tour with Rosa with Paradise Scooters. She was WONDERFUL and extremely knowledgeable about the island! You cover a LOT of ground on her tour, which we did our first full day on the island, and includes a visit to the Conch farm, Chalk Sound, Leeward, Long Bay beach, and lunch at Boogaloos, which was beautiful AND delicious!! You see the entire island, which orients you for the remainder of your trip. We highly recommend this property! We had a very enjoyable stay, the property was very comfortable, unfortunately the A/C broke down but was attended to the next day. Now if we could get a really effective mosquito repellant that would be the icing on the cake, unfortunately we can’t even do that here in Toronto. We had no complaints and would certainly recommend to other people. The property manager was very helpful. Three couples stayed here last week and had a great time. I was wondering if I’d be wishing we’d stayed ON Grace Bay Beach instead but I never felt that way. On the contrary, I think that Leeward Beach is just as beautiful and the fact that it is not even remotely crowded was such a bonus. We spent time on a few beaches and the only one I’d say beat Leeward Beach was Taylor Bay-recommend if you have the time but keep in mind it’s a smaller, quieter beach that is very family friendly. Barefoot Palms is very well stocked and the house is so clean. The pool is wonderful and fun to seating outside. The property management company is amazing. We emailed a couple of times for very minor things and the response from Simone was instant. Just a note, the power and water went out for a short time period (power once, water twice). Not an issue at all, it was back on within an hour, however if we’d known we wouldn’t have called the first time after 20 minutes or so. I am guessing it’s just intermittent outages from service on the island. Anyway, can’t say enough good things about the house, the owner, the management company. We ate out a few nights and our favorite restaurant was Coyaba. It’s close to the house, the atmosphere is beautiful, but it was really the food that stood out the most. Amazing. Coco Bistro was excellent and Mango Reef has a view that can’t be beat. If you are looking for a relaxing, peaceful, getaway location with pool/beach, privacy, safety etc., this is the place. Definitely rent a car. I recently spent 4 days in this lovely home and highly recommend it. I have stayed at many villas in the Caribbean and none have been as well maintained or had as much attention to detail shown as Barefoot Palms. The landscaping is gorgeous with lots of palms and flowering trees. The back yard is to die for…nice pool, lounge chairs, sitting area and the best part of all – a great Tiki bar. The outdoor space is great for kids and adults, and is very private. Inside, the first thing you notice is how fresh and clean the house smells. Not musty like some villas. The layout is great and the decorating is perfect..casual and beachy, yet upscale. You can tell the owners take a lot of pride in their home. The kitchen is well stocked, there are TVs and DVD players in every room, there is an alarm system in the house, and beach chairs, coolers and umbrellas are provided. The villa is located in a quiet, gated neighborhood and is a short walk to a great beach or a short drive to the main section of Grace Bay Beach. The owners are great to work with – very responsive and can answer any and all questions about the island. I can’t wait to go back! Our stay at Barefoot Palms was everything we had hoped and imagined it would be. The pictures of the house are accurate. Our stay was very comfortable. The home was spacious and clean. Everything we needed for our stay was on property. The owners and the property manager were very helpful in recommending activities for our stay and where to dine. The house is a short drive to many spectacular beaches, the marina and restaurants. For our family, it was a huge help being able to laundry throughout the week as needed. Our favorite outings were riding horses on the beach thru Provo Ponies, sailing/scuba diving thru Sail Provo, and Stand Up Paddle Boarding thru Big Blue. Our personal favorite beach was Long Bay Beach. The water is shallow for miles at low tide with minimal waves. Perfect for younger children. The salt water pool in the back yard was enjoyed often when we were tired of exploring and just wanting to relax. Animal lovers beware….there are a ton of stray dogs and cats throughout the island. You are able to adopt healthy pets at no charge and bring them back to the states with just paying the airplane fee. Unfortunately, the puppy we fell in love with had parvo and we are still waiting to learn his outcome after treatment. Animals can be couriered to the USA by volunteers to unite them with their new families. So if you are looking for a new member to add to your family, it is a great opportunity or if you just want to help get one to its new home. Check out Potcake Place and the TCSPCA to find out ways you can help or make donations. We will come back to Provo and would seriously consider staying at Barefoot Palms again. Thank you for sharing your beautiful home with us! Great Villa, Exactly As Advertised. We just returned from a great vacation in Provo and one of the highlights was this Villa. It was exactly as advertised and very well maintained. It was also in an excellent location, close to the beach, but in a quiet residential neighborhood. The owner provided significant information on Provo prior to our trip, which certainly enhanced our vacation. I would definitely recommend this property to anyone visiting Provo. We had a wonderful holiday in this beautiful villa. It was comfortable, elegant, relaxing and safe. We had everything we needed for meal prep in the villa and picnics at the beach. Short walk or drive to magnificent Grace Bay Beach. Fantastic kiteboarding at Longbay Beach, great instructor, Mike Haas of Provokites. Grounds were beautiful, bed was comfy, meet and greet was friendly, great air-conditioning included (which is unusual for the Turks). The owner was very helpful and a pleasure to do business with, credit card payment is so easy. We hope to be back !! After reviewing condo after condo we decided to rent a house that wasn’t on the beach. We chose wisely. The location is perfect, you are very close to Grace Bay restaurants and beaches, Turtle Cove snorkeling, etc. The house is great. Tina the onsite manager is awesome. The owners were very helpful with info before and after the trip. DVD collection and directv helped entertain my 5 yr old daughter. Kitchen was more than adequate. Typical days were like this, my wife and child woke up and went to the shaded patio in back for breakfast, I slept in, then went for a dip in the salt water pool, had a snack, then went to Grace Bay for a meal and beach time, snorkeling in the afternoon at Coral Gardens or Turtle Cove, Heinekens on the beach at sunset, then dinner at Tiki Hut or casual place on beach. Return to house for dip in pool and beers at the poolside tiki bar. When i got back to work it was like getting punched in the face… The nearest beach access is 2 blocks, it was damaged by what looks like Ike in 2008 (?) but a bit further west is another better access. We drove to most beaches so we could go anywhere. My wife appreciated the security alarm, but we always felt secure. Community is gated with nightwatchman. Barefoot Palms was everything my husband and I wanted it to be: beautiful, beachy and as relaxing as a place can be with a 2 year old running around! During our week vacation, we explored the island (I highly recommend renting a car to get around), checked out local shops and eateries (two thumbs up for Da Conch Shack), shelled the beautiful beaches, and relaxed by the picturesque pool and tiki bar. The home was exceptionally maintained inside and out (the vrbo photos are an accurate reflection of the amenities and space). Tropical yet classy decor, a plethora of beach towels, and an extensive movie collection for kids and adults are just a few of the extras that made our stay all the more enjoyable. Food prices on the island are rather expensive so we were glad that we brought our own meat to prepare throughout the week. The kitchen was well-stocked with pots, pans, dishes, etc…, and the outdoor grill made al fresco dining convenient. We highly recommend Barefoot Palms to anyone who wants to enjoy the true spirit of Turks & Caicos instead of a hotel version. It was definitely hard to leave this tropical paradise! Perfect house for a group of us to get away! 6 of us rented this beautiful villa and could not have been more pleased! The beach that it is near was PERFECT for us to walk to whenever we didn’t want to drive to another area of the island. The rooms had plenty of space, with closets and lots of communal space. Having the pool and outside lounging space all to ourselves was perfect for a drink and recap of the day. We agreed that upon return, we would use the same villa. Couldn’t be beat for the price! Beautiful home in Grace Bay! I have booked many vacation homes with HomeAway, but Barefoot Palms is one of the nicest homes I have ever rented. The location is excellent, tucked away in a quiet neighborhood, but is only a block from one of the most beautiful beaches you will ever see! And it’s like a private beach! If you want a larger beach with more people and activities, Grace Bay is a few minutes away by car. As for the house itself, wow! It is beautiful. When you walk in the front door, on one side is a huge master suite with a spacious master bathroom. On the other side of the foyer, there are 2 very nice bedrooms and another bathroom. The living room is inviting and the kitchen area is well stocked for those who love to cook. Outside is a really nice pool, a very cool tiki bar, and a gas grill. If you don’t feel like going out to dinner, you don’t need to! As for the owner, Ramona, she is terrific. We had a few bumps in the road on our end, completely unrelated to our rental, before arriving in Turks, and Ramona worked with us to ensure everything went smoothly, which it did. One last thing – rent a Moke! Google it! We used it daily and really had a blast in Turks. Having Barefoot Palms as our home base was a big part of that. This was our 3rd trip to TCI. First time staying in a villa. The owner is very responsive and she answered all our questions without hesitation. The house is located within a 5 drive minute to Grace Bay Gourmet Grocery and 3 minutes drive to the marina. The beach is a 4 minute walk and depending on how much gear you have you may want to drive. We drove to the beach every visit as we had a cooler ,chairs, large snorkel gag etc… It is super easy to park. No worries. The house is clean and in great shape for a rental property, The pool is fantastic. Our kids swam every day after the beach or our excursions. Perfect mid range house for families or couples. I was apprehensive about renting a villa outside the united states. I had visions of arriving and something be very wrong. surprise was on me! a beautiful villa! larger than we expected. very neat, clean, beautifully appointed. fully stocked kitchen. the backyard was so nice! beautiful pool, nice tiki bar. items provided for use: beach towels, beach chairs, & coolers. how great! there was an adorable neighborhood cat, tiger, that we fed twice a day. such a sweet thing. we took ramona’s advice and utilized grace bay rentals & also went out with caicos dreams. the only thing I would change? : the weather. it rained 4 days out of 7. I booked this rental directly with the owner who was great to work, made it very easy and answered any questions I had. The villa is very clean, nicely layed out with a great pool area and stocked with everything needed. Barefoot is a 2 minute walk to the most beautiful beach I have ever seen and a short drive to restaurants, shopping, yoga, etc. What I liked best about the rental is the location – nice quiet secure neighbourhood close to the ocean. What I liked least was having to leave. Because of the great rental rate at Barefoot we were able to really see TCI and get to other beaches and attractions as well as several fabulous places to eat. I highly recommend Barefoot Palms when vacationing in Turks & Caicos. Absolutely great location. Home was furnished very nicely and pool was excellent . Home was located in a very upscale neighborhood. Wonderful vacation rental that was well worth the price. Barefoot Palms lived up to the great reviews and descriptions online. Everything was just as depicted in the pictures and by the owner. It was spacious, very clean and very comfortable in every way. With 2 teenagers, everyone had their own “space” and we were able to enjoy some downtime on our vacation in addition to exploring the island of Provo. Wifi worked great, the pool was wonderful and most of all the owner (Ramona) and the property manager (Jameka) were super helpful both before and throughout our stay. Ramona gave us tips on things to do, restaurants, etc. and every one of her reco’s was right on! It definitely helped us make the most of our first trip to TCI. The villa is in a great location, very close to one of the prettiest, less populated beaches on the island, and easy driving distance to other beaches and restaurants. Would definitely stay here again if we come back to TCI! My family (3 adults, 2 kids 9&13) just spent 2 wonderful weeks at Barefoot Palms. The house is lovely and welcoming and the layout is perfect. Everything that you need to spend a vacation at the beach is included (chairs, towels, toys, snorkelling gear). The house is located within a real 5 minute walk to the beach. Once you hit the beach, you can walk left toward Grace Bay Beach or right toward Leeward beach. Leeward beach is great for shelling and solitary walks. Although we hardly spent time at the house, it was a perfect base to come back to in the early evening for cocktails at and relaxation after a long day at the beach or exploring Provo. We also enjoyed a cooling dip in the pool at the end of the day. We spent a week at the Barefoot Palms Villa and had a fantastic time. The house is lovely and has everything you need for a holiday. The beach is two short blocks away and we had it to ourselves most days. The house is in a quiet area, but within a 5 minute drive of a small shopping area for groceries and other items. Thanks for a wonderful stay. This review is long overdue – we stayed at Barefoot Palms May 10-19, 2014. The house looked exactly as shown the the photos- clean and well take care of, wonderful beach/ocean decor and well equipped. We enjoyed the pool and relaxing at the tiki bar each day. It is a short walk to the beach and there are a number of other great beaches within a few minute drive…..and none of the beaches near the house were very busy so it was very relaxing. There are beach towels, coolers, and chairs at the house to use. We used the grill on the patio several times and there was everything you need to cook (utensils, dishes, pans). It was quite warm during our stay and we used the A/C in the bedroom in the evenings and had no issues staying within the allotted electricity usage for our stay. The location is very convenient being a quick drive to the Grace Bay area restaurants, and shopping. The only problem we had during our stay was with the TV in the living room as the local cable did not work on that TV only the Dish service but this was due to the cable company changing some equipment not anything the owner had control over. TV in the bedroom worked fine with the local cable. We would definitely recommend this property to friends/relatives and will return again in the future as we had a wonderful stay (wish it was longer) and Ramona was a pleasure to deal with. After traveling several times to beautiful TCI and staying at different resorts, my husband and I decided we wanted to try the “villa life”. Barefoot Palms was the perfect choice for us! Located in the quiet neighborhood of Leeward, Barefoot Palms was breathtaking from every angle. Prior to our arrival, the owner (Ramona) was very helpful and very easy to work with. Upon arrival into PLS we were greeted by the wonderful property manager Val. She was great and explained everything in detail about the villa. Val was also on call for us during our entire stay which was wonderful. We were even welcomed to the villa by a bottle of Barefoot wine, monogramed beach bag and a hardcover book on TCI. Such a great touch by the owner! Barefoot Palms is located just a short walk to one of the most beautiful and secluded stretches of Grace Bay. We also rented a car as always to explore the other beaches of TCI but always found ourselves back at Leeward Beach near Barefoot Palms for it’s sheer beauty and serenity during our stay. Ramona has done a wonderful job with her island home! So many personal touches everywhere you looked! The villa was extremely clean and well maintained and just felt like home to us! The landscaping was to die for and the private pool and tiki bar were just perfect! We loved lighting the tiki torches at night and sitting by the pool with all the beautiful landscape lighting and hearing nothing else except the palm trees in the wind. True paradise!!! The villa has every amenity you could ask for and more. It was well stocked with towels, had a washer/dryer, fully stocked kitchen, a complete library of DVD’s, comfortable beds, a wonderful info book complete with restaurant info and phone numbers and A/C and ceiling fans in every room. The villa felt very safe and private and included a security system which we did set but never really felt like we needed to. Overall, we couldn’t have asked for a better stay at Barefoot Palms! We can’t wait to return! The one major draw back to traveling to Turks/Caicos/Provo is the cost. Food, gas, utilities are all very expensive. The accommodations at Barefoot Palms were very nice, well kept, clean, and well…just like home. The private pool is a super draw for a gathering place for all of our travel group (5 in total). The Tiki bar was a nice place to escape the sun and watch the fun had in the pool. The property is located a short distance from Gracebay Gournet grocery a necessary entity to stock the kitchen. Don’t go searching all over the island for cheaper food. The other Gracebay Grocery down the main road is an IGA store with exactly the same prices as Gracebay Gourmet. The Price Club grocery even further down the road has better prices but the quality is somewhat less. Back to the Villa. The place was well maintained with plenty of necessary items, towels, linens, kitchen stuff (includes coffee maker, crockpot, etc). Simpley put it was just like being at home…everything you needed was right there at your finger tips. The check in process was very easy and someone was available the entire time we were there on an as needed basis. Gracebay car Rentals was a very easy group to work with as we rented an SUV from them. They met us at the airport and had a very convenient drop off procedure directly at the airport. I highly recommend Gracebay Car rentals. We went to scuba dive and planned our trip with Big Blue Unlimited. We dove eleven dives over a six day period. This company was the absolute best I have dove with. They have guided excursions, their boats are well maintained and operated, and they are interested in making sure you get well acquainted with the local fish population and underwater geography. I highly recommend Big Blue Unlimited for scuba diving. Barefoot Palms was perfect for our family and two-year old grandson. We loved the tiki bar, clean salt water pool, great outdoor private fenced in area, beach chairs, umbrellas, awesome air conditioning and every amenity for cooking! We could walk two short blocks to Pelican beach which was all to ourselves! Perfectly calm – perfect blue water. On a side note, I had to stay connected to work and the Internet at the house was excellent. The owner was very helpful in every question that we asked (Thanks Ramona) and lives in Virginia. very nice villa,everything was great after a little trouble checking in,it was awfully hot and humid for the first four days but aircon worked great,would consider returning.Great beach close by. Very good managers – friendly and flexible. Everything worked fine – elec, wifi, TV, pool, etc. Quiet and safe part of the island 5 min drive to waitrose stocked supermarket, 5 mins walk to white sands and milky blue coloured sea … 5 mins drive to Big Blue snorkelling company, 7 mins to Conch farm, 20 mins or so to the centre of grace bay, coral gardens mini-reef. Spacious – most important – there was plenty of room and it felt like that – the whole family relaxed and had rooms to escape to. We generally did not need bedroom aircon units for more than about 5-10 minutes before sleep – main room aircon was good to have on. Alarm system easy to use. Traveling to Turks and Caicos to the first time, our experience was positive before it even began. Before we even booked the villa, the owner was sharing thoughtful and important recommendations that would eventually make this a vacation to be beat. The villa is slice of paradise – and truly a home away from home. It was a perfect size for six people – we had plenty of space – and every amenity any of us could have wanted. The outdoor space can’t be beat – we grilled regularly and launched each of our days from pool area. Don’t forget your ipod – you can move the speakers out to the tiki bar to really set the scene. It’s a very short walk to Leeward beach – which you’ll likely have almost to yourself. Pelican beach is a bit longer of a walk, but can’t be missed, especially if you want to take a conch home. If you are looking for a relaxing and rejuvenating villa, look no further. We can’t wait to go back! Barefoot Palms is truly a home away from home. It has all the amenities under one roof. All rooms were comfortable. The backyard was extremely private and relaxing. It is minutes to the beach and close to all restaurants and excursions. The owner and management company were extremely helpful with great tips on what excursions to pick, and didn’t disappoint. We stayed for the month of January and would pick Barefoot Palms over a resort now and in the future. I can’t begin to explain how perfect this rental was. From the booking process through the time we left, it was a perfect trip. Before we traveled, the owner contacted us to make sure we would have everything we needed. Upon arrival, she had the property manager meet us and give us a tour of the property. She had given recommendations of car rentals, restaurants, and water sport tour companies to use along with discounts that were available. As far as the home itself, it was the nicest place we’ve ever stayed. It was clean, comfortable, and so accessible to everything. I cannot think of one thing to complain about. The private pool and Tiki bar were amazing! This is the first time I’ve ever stayed somewhere where the pictures didn’t do it justice. This home is an excellent option for an average family or a few couples. The place is on the newer side, well equipped, clean and maintained. So, the pictures speak for themselves. It is with-in a semi-gated residential community and is private without feeling isolated. I heard the neighbors driving by but, I can’t say I actually saw a person. There is plenty of room to spread out, watch TV, WIFI, lounge by the private pool and star gaze in the evening. The Milky Way never looked so bright at home! The house is not directly on a beach but the Leeward beach accesses are walkable and are part of the beautiful marvel that is Grace Bay. One of nearest beach accesses you can practically drive up on and are only steps to the Atlantic surf! You will need a car (amazing how fast you get used to driving on the left) for the convenience of grocery shopping, beach/island hopping (finding Taylor Bay Beach is half the fun!) and restaurant dining. Driving, you are literary minutes from most of the islands excellent restaurant selections, resorts, shopping and the small casino. Our trip to the Turks & Caicos on the island of Providenciales was a wonderful family vacation! We stayed at the beautiful, quiet home called Barefoot Palms. It is a very nice residential neighborhood centrally located to everything we wanted to do. We felt very safe and at home in the well kept tropical themed house. The property manager meets you at the airport and brings you to the home and shows you how to work the Security System, WiFi, TVs and more. The WiFi connection is very strong and the home owners have an extensive video collection for children and adults if wanted. The backyard, with its saltwater pool and tiki hut, was a nice retreat to have when wanting to relax. Having the ability to do laundry was a huge plus for our week on Provo. Our personal favorite beach was Long Bay Beach. The water at low tide is shallow for miles…a perfect spot to go with the kids. We highly recommend riding horses on the beach thru Provo Ponies, Sailing/Snorkeling with Sail Provo, and Stand-up Paddle Boarding with Big Blue Unlimited. We highly recommend staying at Barefoot Palms. 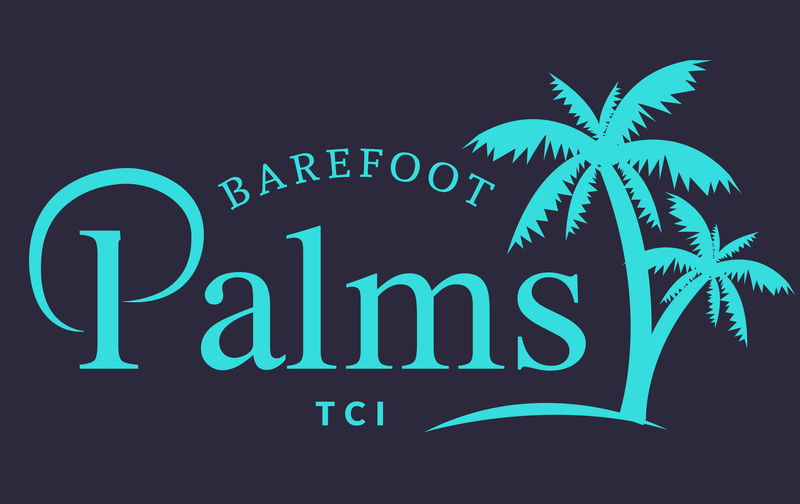 We would recommend Bare Foot Palms to anyone looking to travel to Turks & Caicos. The location is ideal, approx 4 minutes to downtown. 2 minutes to the beach. Which you might as well call private as it is so peaceful. The area is secure,alarm in the home and mobile patrol all night. But honestly, I felt safer in Turks in Caios then I would in NYC. I can tell you the house is on the upper class scale of living.Tile everywhere, granite counters, Stainless appliances. Air Conditioning is ice cold in the house. The King bedroom had one of the best mattresses I have ever slept on. Kitchen is fully equipped to make dinners for you and the family during the stay. Bbq is provided as well. Booking was easy and painless. Ramona is a great contact to have to help plan you visit to the island. I hope whom is reading this takes the chance to give Barefoot a try.